Not long ago we took breaking bluefish and rockfish for granted in the Chesapeake Bay. Unfortunately, times have changed. 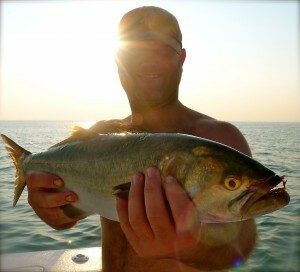 Since there are a lot fewer fish now, we have to look a lot harder and longer for summer breakers. Granted, it’s easier on some days than it is on others. 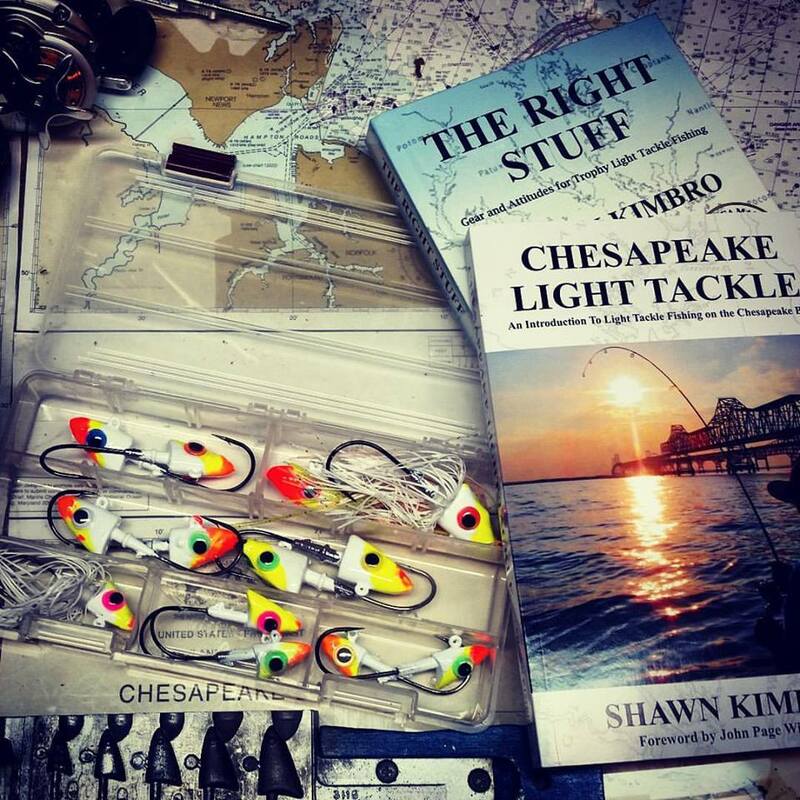 In my book, Chesapeake Light Tackle, An Introduction to Light Tackle Fishing on the Chesapeake Bay, I dedicate several pages to methods for locating breaking fish. The best strategy for finding blitzing fish under working birds is to head straight for the closest oyster bar. In my reports, I often mention that I find fish over live, hard bottoms. By that, I mean places where there are active shellfish populations. I typically plan all my fishing trips so that I keep my boat over as many oyster bars as possible. That includes when I’m just running from one place to another. 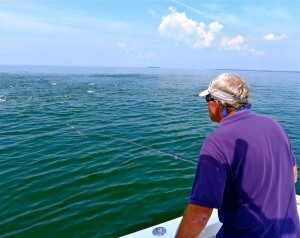 For fish to feed on the surface in the Chesapeake Bay they need three primary ingredients. In the book, I abbreviate the formula like this: C + B/HB = BF. That’s current plus bait over hard bottoms equals breaking fish. This past week my luck in finding breakers has been mixed. Wednesday and Thursday evening I ran for miles and didn’t see a single school of keeper-size fish. What a difference a day makes. Friday, I couldn’t miss. The fish came up right where I wanted them to be and fed on the surface for hours. There wasn’t much point in casting. 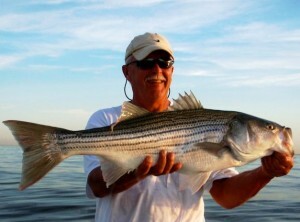 Any lure thrown into the melee of blitzing stripers and bluefish would surely catch something. Sometimes, it’s just as much fun to sit and watch. 1. Throw Big Surface Plugs: Even though the blitzing rockfish and blues are usually feeding on small minnows this time of year, they can still be caught on big plugs. By big, I mean four-inches or longer. The little fish will sometimes ignore it, but usually they’ll hit at it even though it’s too big for them. Since rockfish are very competitive, bigger fish will come to investigate the commotion, and some of those fish will be big enough to get the lure in their mouth. I hardly ever cast small topwater plugs to breaking fish. The hard part isn’t catching fish, it’s keeping the little guys off long enough to give the big ones a chance. Big Lonely Anglers and full-size Stillwater SmackIts are a good choice. 2. Up-Size Your Hooks: I don’t like treble hooks, but they can sometimes be an advantage in catching bigger fish. A big wide treble hook is too big for small fish to get in their mouths. They don’t get caught when they strike, but the hooks will fit inside the mouths of better fish. 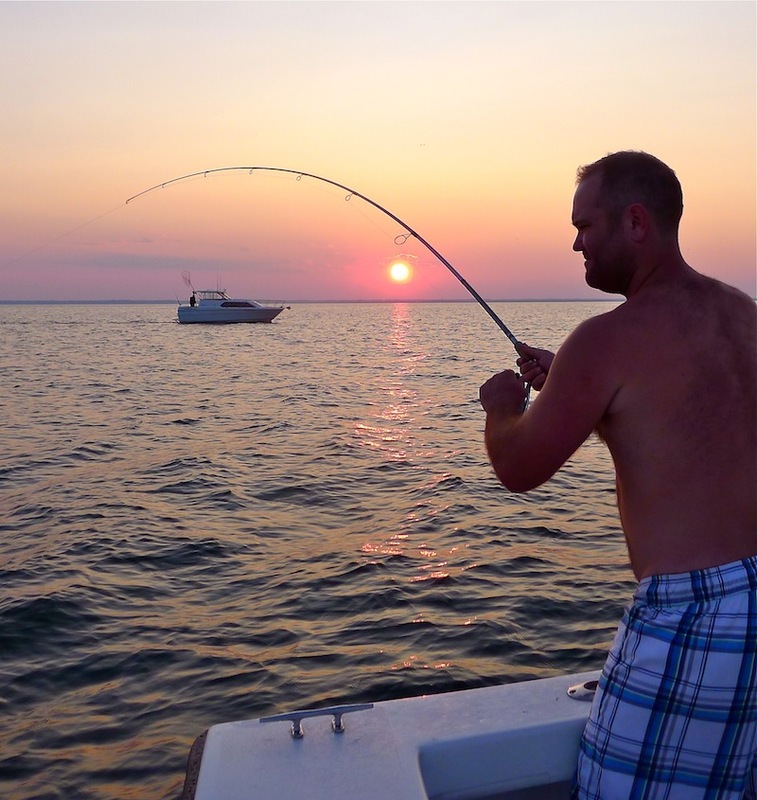 Move up to big hooks and catch bigger fish. Also, don’t forget to mash down the barbs on your treble hooks before you start casting. Things get crazy during a rockfish and bluefish blitz. When there are lots of fish coming over the side there are also lots of dangerous hooks flying around. Give the fish a break and save yourself a trip to the Emergency Room by mashing down those barbs. 3. 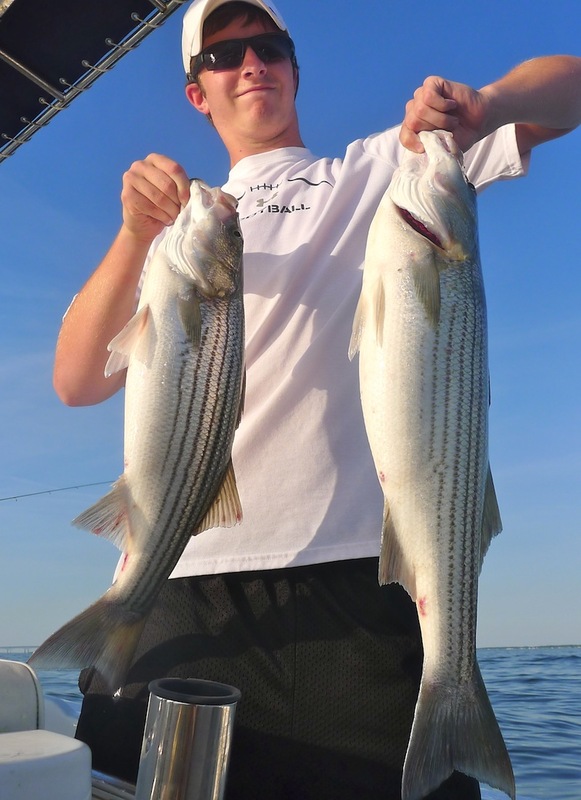 Jig Deep: Usually, striped bass run in schools of similar aged fish. Year old fish usually school by themselves in shallow water, but two and three year resident rockfish will run together over deeper water. These fish can be anywhere between 15 and 30 inches (with a few smaller and bigger mixed in). Sometimes bigger lazier fish will hang down-current and below blitzing stripers and blues. 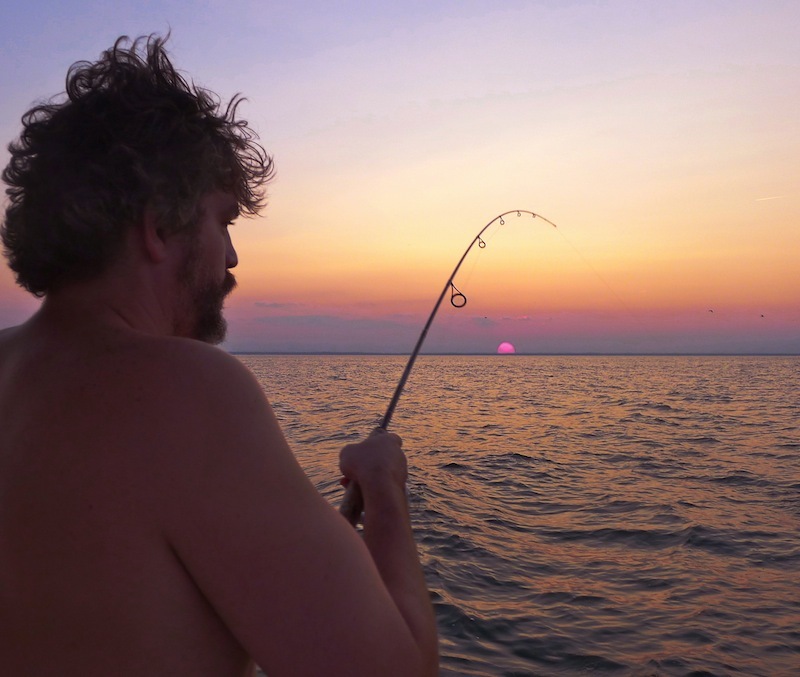 It doesn’t always work, but try jigging on the bottom sometime and see how you come out. 4. Ignore Little Birds: Just like young rockfish, immature gray-winged herring gulls and terns feed on rain minnows and Bay anchovies. In late summer and fall, many fishermen are fooled by large flocks of immature gulls. Small dark-winged gulls over shallow water almost always mean small fish below. The birds are learning to catch minnows just like the little stripers beneath them are learning to round them up. It’s unusual to get keeper rockfish under immature gulls. 5. 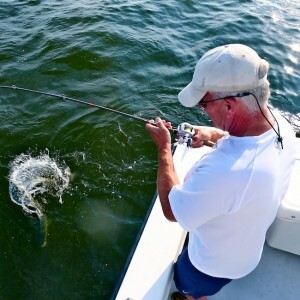 Practice Noise Discipline: When fish are breaking, things can get very loud. You can still catch breaking fish no matter how noisy you are, but don’t forget that bigger fish are smarter, so they’re more likely to be aware of a predator in their midst. Noise discipline is important in breakers if you’re looking for bigger fish. When you find breaking fish, look closely at the direction the birds are flying. They are almost always facing the wind and turned in the direction the fish are moving. Make a wide circle around the birds, settle in above them, and kill your engine. You’ll either drift over the fish or they’ll swim right toward you. If you leave your engine running, they won’t get close. Turn it off. Don’t talk loudly or stomp in the boat. If you are stealthy enough you can often see stripers cornering bait right up against the side of your boat. Take a look at the video at the end of this post and you’ll see what I mean. Once you drift past the fish, or when they move on is the time to restart and make another wide circle. By repeating this process you can sometimes stay on the schools for hours and you’ll usually catch bigger fish. 6. 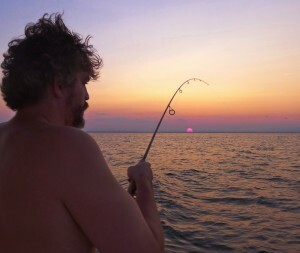 Avoid the Crowds: Since there are far fewer schools in the Chesapeake Bay than there once was, it’s not always possible to find fish away from the crowds anymore. Nevertheless, don’t give up on the possibility of leaving the fleet to look for fish feeding somewhere else nearby. Surface blitzing fish is an indicator that conditions are right for fish to feed, so it’s likely they’re are more fish feeding somewhere else where conditions are similar. You may have heard the old adage, “Never leave fish to find fish.” Nothing could be farther from the truth on the Chesapeake Bay. I’d modify that to say, “Always leave little fish to find bigger fish.” I really don’t like fishing in areas where there are lots of other fishermen or boats trolling though the schools, or any of the other nonsense that goes along with fishing with the crowds. When the bite is on at one place, it’s probably on someplace else. Take the risk. The best places to find schools of two- and three-year-old blitzing fish right now include the upper Bay near Rock Hall then across to the Knolls, or in the Mid-Bay on the north, west, and south sides of Poplar Island. There are a few other places of course and things are changing rapidly, so they may not be there tomorrow. Your best bet is to hire a guide who is keeping up with the schools, or plan on burning some gas looking. We’ve been getting some pretty nice bluefish mixed in with the rock, and this week the Spanish Mackerel have shown up in force. Check out this video I shot yesterday of breaking fish. Notice how, with a little stealth, you can have fish blitzing 360 degrees around your boat, even trapping bait against the side of your boat. Good luck getting bigger fish out of the breakers this summer. I hope you’ll let me know if these tips work for you, and please don’t be afraid to chip in with a few of your own. Second, and more importantly, I have a question, well two. I like the “C + B/HB = BF” equation, but do you think cloud cover has as much of an effect with regards to inspiring rocks/blues to break as it does with large/smallmouth bass on freshwater lakes? Are rockfish who aren’t breaking but ARE hanging around shoreline structure more likely to attack topwater baits in overcast conditions, like bass? how can i contact shawn! HAVE YOU TRIED ANY RATTLETRAPS IN THE BREAKERS? I HAVE HAD A SLOW YEAR MYSELF,BUT THEY SEEM TO BE ONE OF MY BEST BETS.THEY WOULD GET DOWN BELOW THE SURFACE ,HAVE A TIGHT WIGGLE AND ALOT OF SOUND. Rattletraps work fine in breakers, then again, so does a buzzard feather and a coat hanger. Breaking fish don’t care, so better off using big plugs with big hooks in hopes of getting the bigger ones out of the school. Daniel, shoreline feeding stripers are absolutely more inclined to hit a plug in low light/cloudy days. I think schooling fish in open water relate more to current and bait than they do to low light. Not unusual for them to blizt for hours in mid-day sunlight.